On the 1st of August, 2008, twenty-four climbers from numerous countries set out for K2's summit. It’s an extraordinarily beautiful day for climbing. About 1,312 feet from the mountain’s top—at 26,939 feet (8211 meters)—is a rock-lined bottleneck located under a huge serac. Serac is the word for a massive overhang of ice (which can crack at any time). Climbers are at one of the most-dangerous places on K2. Before this climb, more than ten people have died there. This bottleneck, on K2, is like a corridor through which climbers must pass before they can either summit or descend the “savage mountain.” The serac, on this particular climbing day, is nearly 100 meters high. Since pieces of ice can fall at any time, from this serac, the best way to get through the bottleneck is to pass through as quickly as possible. On the 1st of August, however, climbers were in a queue, waiting to get through. Not only is it exhausting—waiting, at about 8200 meters, to get through the bottleneck—the wait forces climbers to stop moving at their own pace. The first accident happens when Dren Mandic, from Serbia, becomes fatally detached from the fixed rope. Should the rest continue to the top? Deciding to move on, other climbers reach the summit. Eighteen people make it to the top. 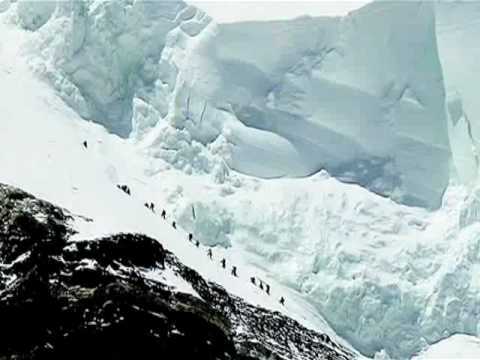 On the way down, these eighteen individuals must pass through the same bottleneck with the same overhanging serac. Everyone is feeling good, though, and the weather is holding. Then ... something happens on the mountain. Stories start showing-up in the news or on web-based blogs. While loved ones are waiting to hear whether their climber has reached safety, they start reading about deaths on the mountain. They also read lines, from land-based writers (or anonymous news-article commentators), such as “Just pure stupidity” and “Reckless incompetents commit utterly predictable suicide” (describing the actions of mountaineers wishing to summit K2). What is actually happening on K2? After spending the night on the mountain, due to lack of needed visibility on the climb-down, numerous experienced climbers are freezing cold and utterly exhausted. Some are still above (or near) the bottleneck and its dangerous serac. An avalanche had swept-away the fixed ropes that climbers used for their ascent. Marco Confortola, a mountain rescuer, safely traverses the bottleneck. Soon after, he hears a booming sound and, looking up, he sees an avalanche originating from the serac (about 400 meters above him). It will become a fatal avalanche for at least one climber—Gerard McDonnell—Confortola’s climbing partner. Pemba Gyalje, an incredibly brave and talented Sherpa, risks his own life to save other climbers. After spending many hours in “the dead zone”—the altitude above 8,000 feet—Pemba successfully accomplishes his life-saving efforts for two individuals. But eleven people die, from various causes, during the August 2008 K2 climb and descent. Those tragedies remain the worst-single set of accidents in the history of K2 mountaineering. Picture of K2 from the junction of Vigne Glacier and Baltoro Glacier, on a mid-afternoon in July, by ppatenall. Online via SummitPost.org. Bos, Carole "Death at K2 - August 2008" AwesomeStories.com. Jul 31, 2017. Apr 23, 2019.